Baconfest is here – five segments featuring: Stan’s Donuts, Nueske’s Bacon, Community Tavern, Uncle Dougie’s Bloody Mary, Michael Jordan’s Steakhouse. Dane Neal – Bacon on bacon on bacon imminent! It’s like Taste of Chicago, but everything is going to be bacon. Baconmania Strikes Chicago: The Eighth-Annual Baconfest is Coming! 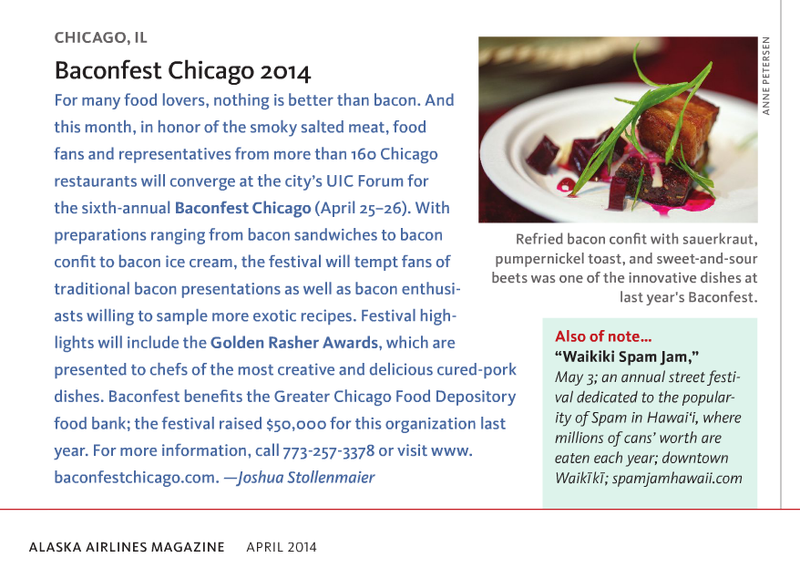 Chicago It’s Time For BaconFest! Spike Manton - Going to this year’s Bacon Fest? Yes, please! Pete McMurray - Baconfest 2015!!!! Frank Fontana - Baconfest takes over the WGN Radio Studio! 10 THINGS TO DO: Including Buy Baconfest Tickets. Chef Gil Langlois and Baconfest Organizer Andre VonBaconvitch talk bacon cotton candy and Baconfest. Sponsor Bleeding Heart is along for the ride, as well as product from sponsors Nueske’s and Das Foods. Mark explores Chicago’s obsession with Bacon, including visits to Baconfest sponsors the Fifty/50, Das Foods and vendors Vosges and Salted Caramel. Finally, Mark pays a visit to Baconfest Chicago 2010, talks to co-founder, Seth Zurer and enjoys a bacon cocktail. Johanna Anonuevo exposes BFC to the nerds of G4TV in this homebrewed Attack of the Show Viewer Army segment. And be sure to check out the individual Chef Short Video Features on the Baconfest Chicago Youtube Channel, courtesy of Kyle Hamman and KBH Media. MMMMMM … the sputter of frying bacon. An artery-clogging symphony for the ears. We could hardly resist the event at Logan Square’s posh Stan Mansion—and neither could anyone else, apparently: The event sold out 800 tickets for two sessions. In addition to vendors displaying their bacon wares, 24 chefs from restaurants like The Bristol (2152 N. Damen Ave., 773-862-5555) and Otom (951 W. Fulton Mkt., 312-491-5804) presented the ingredient in inventive ways, right down to boozy iterations of the meat being served. And while we can’t explain the obsession, we can present these highlights from the bacon-y bacchanalia. Bacon is truly the Helen of Troy of meats,” says Baconfest co-founder (and acclaimed theatrical sound designer) Andre Vonbaconvitch. And if all goes according to plan, bacon is going to be the meat that launches (nearly) a thousand plates Saturday April 10 at the Stan Mansion in Logan Square. BaconFest Chicago! — a thoughtful celebration of all things bacon held April 10 — featured many of Chicago’s finest chefs making bacon dishes of their choice, a multitude of sponsors that included The Onion, vendors such as Vosges Haut Chocolat and Nueske’s, an amateur bacon recipe cook-off between five finalists and a Bacon Bar and Lounge. It sold 600 tickets in 15 minutes at $45 for one of two sessions, each featuring 12 chefs.